Accreditation is a voluntary exercise focusing on patient safety and improvements to quality of service through on-site peer reviews. Accreditation is an organization-wide, ongoing process that encourages and demonstrates continuous improvement. In May 2015, Hawkesbury and District General Hospital (HGH) received Accreditation Canada’s highest ranking: Accredited with Exemplary Standing. Only one in five healthcare organizations in Canada manages to obtain this level of accreditation. This accreditation reflects the excellence and high degree of engagement and accountability demonstrated by all HGH staff and physicians. The accomplishment is true to our mission to provide compassionate care to our patients and families throughout the cycle of life. Accreditation Canada (AC) is an independent, not-for-profit organization that works with healthcare organizations to help them improve quality, safety and efficiency so they can provide patients with the best possible care. AC establishes standards and manages accreditation programs designed to improve client outcomes and health system performance. 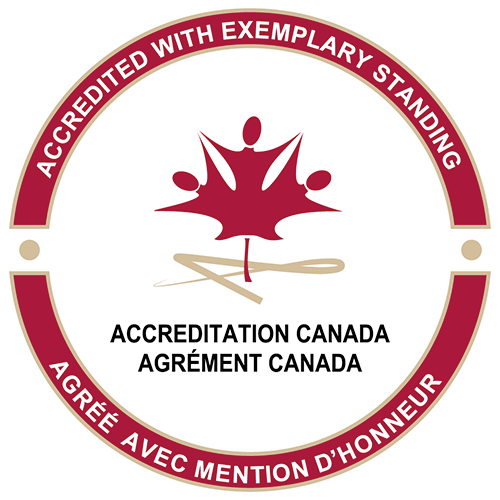 Accreditation Canada accredits over 1,200 organizations representing 5,700 sites and services across Canada. For more information, visit Accreditation Canada.